Rs 150 crore for safety of women on roads. Assistance to disabled to be hiked. Currency notes with braille to be printed. One year pension for all senior citizens. Rs 6,000 crore for welfare of senior citizens. Every household to be under sanitation drive. PM irrigation scheme to be set up. National Skill Development Mission soon. 100 smart cities to be set up. E-visa facilities at nine airports soon. FDI limit in defence manufacturing raised to 49 per cent from 26 per cent. FDI in manufacturing via automatic route:FM. Big FDI sops for housing sector:FM. India needs a job creation booster:FM. Tax regime will encourage investors, says FM. Will ensure stable, predictable tax regime:FM. It's time to implement GST, says Jaitley. Subsidies have to be more targeted, says FM. Target of 4.1 per cent fiscal deficit daunting:FM. Need to introduce fiscal prudence, says FM. Country looking at higher growth:FM. Looking at 7-8 per cent growth in 3-4 years, says FM. Expect low levels of inflation in future:FM. Arun Jaitley to present Union Budget shortly. Sensex trading 66 points higher ahead of Budget. FM may announce tax benefits for senior citizens. PPP model to fund infra is expected. Tax sops, infra status for housing sector expected. Price stabilisation fund expected to be announced to tackle inflation. Sensex trading flat ahead of Union Budget 2014-15. Basic tax exemption limit of Rs two lakh is likely to be extended by Rs 1 lakh, giving relief to salaried taxpayers. The FM is likely to extend the amount of deduction under section 80 C to Rs 2 lakh. The economy grew 4.7 per cent in 2013-14, slower than an official estimate of 4.9 per cent and higher than 4.5 per cent growth a year earlier. Jaitley's Budget is likely to address structural issues of an economy which has seen growth below 5 per cent for the second consecutive year. A Reuters poll of economists has predicted the government would set a new fiscal deficit target of 4.4 per cent. The Economic Survey's tone increases speculation that Jaitley, will give a higher, more realistic fiscal deficit target for this fiscal year than the 4.1 per cent of gross domestic product the previous government set. Recently Jaitley said the acceptable level of fiscal deficit is 3 per cent and it should be controlled through economic expansion and tax buoyancy, not slashing expenditure. The FM will announce fiscal deficit target for 2014-15 in his Budget. The FM may announce a timetable for the introduction of a Direct Taxes Code (DTC) to widen the income tax net, boost revenues and reignite India's savings and investment rate. Jaitley is also expected to cash in on soaring stock markets and sell government stakes in major public companies to raise funds and bridge the gap between revenues and expenditure. Jaitley is likely to cut subsidies on fuel and petroleum products to reduce India's $40 billion subsidy bill - a key reason for the wide fiscal deficit. The government is likely to cut gold import duty from a record 10 per cent in today's Budget. The Economic Survey tabled by Jaitley in Parliament on Wednesday calls for fiscal discipline, rationalising subsidies and reforming the legal and taxation system. The FM's Budget may make provisions for taking these steps to spur economic growth. The FM may announce scrapping of the provision of retrospective taxing of corporate mergers and acquisitions to restore confidence of domestic and foreign investors. The FM may outline the roadmap for rollout of Good and Services Tax. For boosting investment, Jaitley is expected to announce tax incentives for industry. His Budget is likely to contain tax sops for the salaried, dumping of the controversial retrospective tax and steps to revive investment and manufacturing for growth. Jaitley will aim to balance populism and economic pragmatism when he presents India's 84th Union Budget in Parliament today. A patrician figure who would not be out of place in London's High Court, Jaitley is the son of a successful lawyer. Jaitley has set out his stall as an advocate of fiscal prudence and growth-friendly policies. He has called for faster approvals for infrastructure projects and criticised arbitrary tax rulings under the previous government for stifling investment. This is Jaitley's first stint as Finance Minister. He had served as Trade Minister and Law Minister more than a decade ago under the National Democratic Alliance government led by the BJP. Jaitley, 61, is a leader of the Bharatiya Janata Party and a member of the Rajya Sabha since 2000.He has held several ministerial posts since 1999. 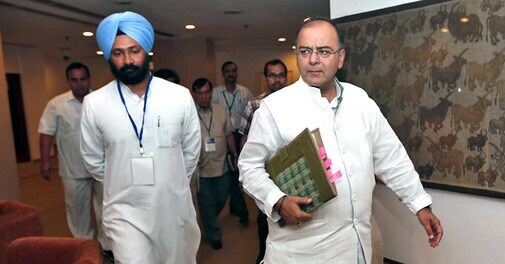 Finance and defence minister Arun Jaitley will present his maiden Budget in Parliament today.